Summer is the time to enjoy lush, green grass. And the quality of your lawn becomes even more important when you start planning annual block parties and outdoor events with friends and family. While it takes some maintenance to achieve a thriving lawn when the weather gets hot, there are several tips to keep your lawn healthy in the summertime. It’s tempting to think that more fertilizer is always better, but you should actually only fertilize in the spring and fall. Fertilizing can make your lawn thicker and keep weeds away, but it will also make your grass grow more. 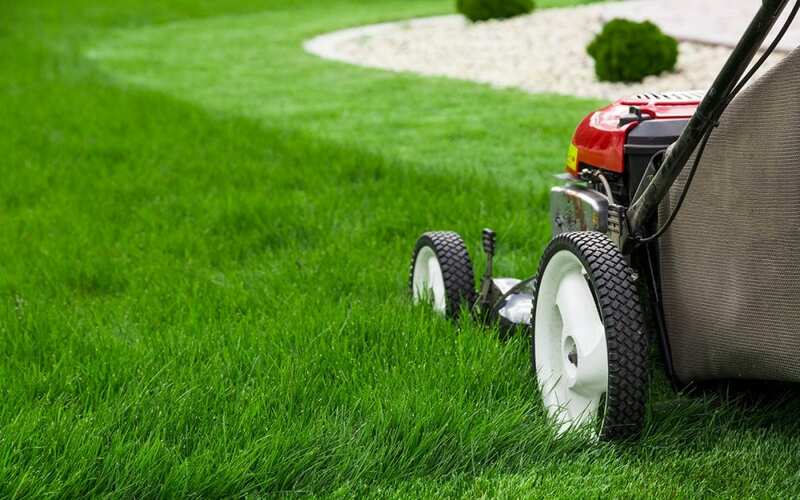 When your grass grows faster, that means that you will need to cut it more often. There are many techniques that people use to water their grass during the summer months. Some people avoid watering during the middle of the day when the sun is the hottest because they are afraid that the early afternoon sun will scorch the lawn. This, however, isn’t the real reason that you shouldn’t water during the middle of the day. A better reason to avoid this practice is that too much of the water will evaporate before it reaches the roots. Also, watering in the evening is not the best option either. When you water at night, you will have more problems with mold and other diseases because the water doesn’t evaporate quick enough overnight. The best practice is to water deeply in the morning. When you water in the morning, you are allowing the water to soak into the soil before the sun comes out in full force. And when you water deeply, you are helping the roots become more firmly established because they will extend deeper into the soil to find the water. If you water less but more often, the water will only reach the top part of the soil because the water won’t penetrate as deeply. This will leave you with a weakened root system. When you cut your grass, there are two things that you should be aware of. First of all, to get the best grass possible, make sure that your lawnmower’s blades are sharp. Dull blades will tear the grass rather than cut it. This will lead to browning around the edges of the blades of grass. Secondly, you should skip bagging and let the grass clippings serve as a natural fertilizer. The clippings have nutrients, such as nitrogen, that feed your lawn and protect it. Aerating is one final trick to get the best grass. It works well to help air and water reach the roots, and in the long run, you will have a healthier lawn the next time that summer rolls around. You should aerate if you have heavy thatching or the soil is heavily compacted. The spring or fall is also the best time to aerate your lawn. If you want to keep your lawn healthy, you’ll need to do some maintenance, but it’s probably not as much as you think. Many of the tips are things that don’t require extra work, such as leaving the mulch from your lawnmower behind. With just a few extra hours at key times of the year, you can achieve a lawn that you are proud of! Oasis Home Inspections provides home inspection services with free thermal imaging to Brevard County in Florida. Contact us to schedule an appointment with licensed home inspector Mike Louden.